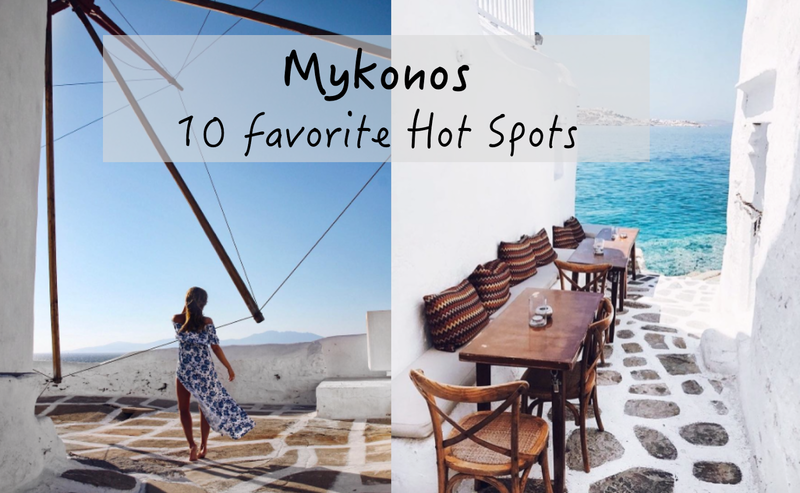 I recently came back from my vacation in Mykonos (as you might have seen on my Instagram) and would like to share my 10 favorite Mykonos Hot Spots! Mykonos is one of the most famous islands in Europe, with a great beach life, beautiful scenery and most and formost a world renewed party scene. If I were to relate my experience in Mykonos to anything, it would be a combination of a vacation in Ibiza and Las Vegas. But Mykonos has a lot more to offer than the beach parties and night clubs. Paraga Beach is a beautiful sandy beach offering a couple of beach bars. One of the most 'posh' beach bars in Mykonos is located here - the Kalua Beach Bar. I went there in the morning and most of the sunbeds were available but if you go there later in the day you will hear the waiter saying that most of the sunbeds are already reserved. It costs around 30 € to get two sunbeds and an umbrella (average price in Mykonos) and you are provided with towels and a very friendly personal waiter. Everything stays quite here on the beach until 4 pm and then the Kalua Bar turns into a crazy party! It stays classy though (unlike some other beach parties on the island) and has a really nice vibe. This is a go to restaurant for organic, locally grown food lover. The menu is extensive and tasty and the location in downtown Mykonos (Chora) is perfect for sunset views. A lot of people gather here to enjoy the sunset and you will hear them applauding after the sun sets down because it is just beyond beautiful. I loved this beach! Mykonos has a large gay scene but Super Paradise Beach in particular has a reputation for being a "gay beach". If you are straight, gay or indifferent this beach is a must go while visiting Mykonos. Expect to see very attractive people and experience the party at the Super Paradise Beach Bar in the afternoon. Oh, and swimwear is optional here. I tried different spots for Ice Cream in Mykonos, but this one was my favorite! See a picture of my all black cone and dark chocolate Ice Cream from Kayak here. I will write a detailed review about this place soon because I really fell in love with Scorpios. This place is m a g i c. But for now I am leaving you with the order to go there while visiting Mykonos. 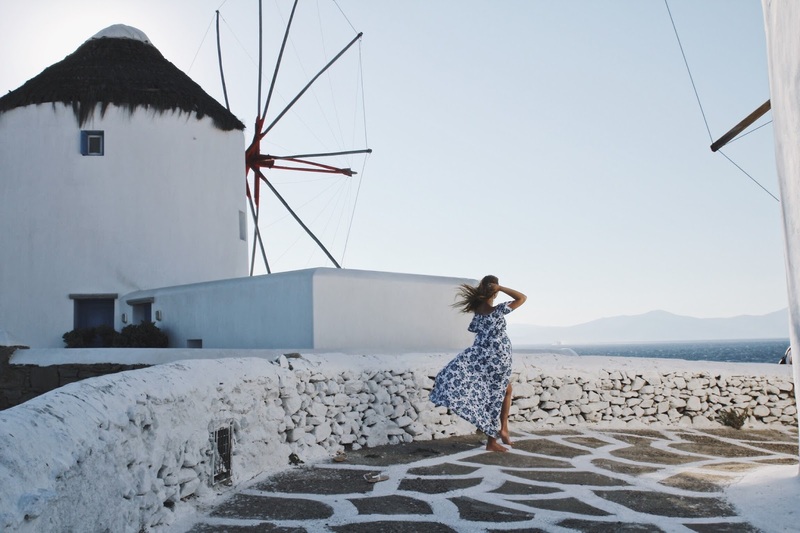 Mykonos is known to be the "Island of the Winds" and their Windmills are the key sights of the island. They are located in Chora by the water and if you go there in the evening this is the most romantic place to be during sunset. At the Bowl you can enjoy healthy, delicious, organic food and juices. The owner of this place are from Australia and the restaurant really reminded me of my wonderful breakfast experiences I made in Australia. They offer a variety of gluten free, vegan options and their breakfast bowls are to die for! The Scandinavian Bar is located in Chora and a go to place for people who want to party. During the day this place stays quite but expect to see a packed crowd in the evening, dancing bodies and plenty of girls up on the bar getting wild. If the upstairs area is too crazy for you, you can enjoy your drink downstairs where you can hear the music but does not have to be afraid to be smothered by a stranger. The Ftelia Restaurant happened to be my favorite restaurant on the island. It is located at the northernmost beach on Mykonos, inside the rocks, next to the sea. They offer Mediterranean cuisine with a touch of Italian deliciousness. The waiter are dressed like hippies who just came back from surfing and they make you feel like you are at a friends place having dinner. And I loved the bohemian interior and the sea view during sunset. Nammos is located at Psarou Beach and the most famous and most expensive beach bar on the island of Mykonos. This is where the rich & famous pop their champagne bottles after arriving with their yachts. During my stay Kendall Jenner and Bella Hadid enjoyed their time here with a big group of people. Expect to pay 130 € for a set of sunbeds but if you are not willing to pay that much there is also the option to rent the sundbeds from the snack bar that lies directly next to Nammos. And you can still hear the music from Nammos and swim in the same water like your wealthy neighbors. Like most of the other beach bars on the island, things are getting wild at around 4 pm at Nammos. The music will get loud and guests at Nammos begin dancing on on the beach and on the tables in the restaurant. This place is an experience but don't forget to bring a full wallet while visiting.